I bought a Lenovo Flex 2 14 laptop and like many new computers it came with lots of software pre-installed – often called bloatware – that I didn’t really need. A fresh Windows 8.1 installation was surprisingly easy. Here’s my shiny new full HD semi-convertible laptop (and a cat) with a selection of unnecessary software (the laptop, not the cat). Lenovo recently came under serious fire (as reported by Computerworld) for pre-installing known malware including something called Superfish. Lenovo have since provided users with a tool to completely remove the offending software. As a bit of an IT professional I know the other benefits of raw, clean, Windows installations. I choose what software I have running on my computers, not the manufacturers – who are often paid to add the unnecessary stuff (also called, ahem, “crapware”) that can actually make their new computers run much slower than they need to, which is like shooting themselves in the foot! This is how I took the brand new laptop from un-boxing to running a completely clean, super fast, bloat-ware free Windows 8.1, downloaded directly from Microsoft, with the only contributions from Lenovo being any drivers which Windows doesn’t have built in. Out of the box you power up the Lenovo and you are taken through what looks like a regular Windows initial setup – albeit with a little bit of Lenovo licencing blurb at the beginning. That is probably the stuff about letting them install 3rd party crap software on your computer that will slow it down and share all kinds of stuff without you realising. At the end of this process you are presented with the Windows 8.1 Start Screen with all those bloatware tiles. …and there is even more when you tap the down arrow to show all apps! Of course, you could go to the control panel and just uninstall all the extra software but to be sure of a perfectly clean Windows installation you have to install from scratch. Also, Lenovo has admitted to pre-installing verified malware and we all know that simply uninstalling doesn’t get rid of all malware components. When installing a fresh copy of Windows you would normally have to enter the licence key at some point. This sometimes causes problems with computers that had Windows pre-installed. Sometimes you need to install software that tells you what the licence key is before you do the clean install, other times the licence key is printed on a label somewhere on the computer or in the supplied documentation. That was not the case with the new Lenovo as it is one of the new breed of computers that has the licence key embedded into the computer’s BIOS (the internal ‘firmware’ of the machine). This means that you never have to enter a licence key to activate Windows as long as you install from the correct installation media which matches the version of windows that was pre-installed. After creating the recovery partition backup on a USB stick you can use a tool like USB Image Tool to make a copy of it which you can store on your PC (or NAS). Should you ever need it you can use the USB Image Tool to re-create the bootable USB drive. Microsoft make it easy to download the installation media you will need for a fresh install of Windows 8.1 – click here, read the instructions carefully and click the Create Media button to download and run the media creation tool. For my Lenovo Flex 2 14 I chose Windows 8.1 English (United Kingdom) for the language, Windows 8.1 for the edition and 64 bit for the architecture in the media creation tool. I first chose to directly create a bootable USB drive but that failed a couple of times with an unknown problem so I ran the tool again and chose to create an ISO image which could later be burned to a DVD or used to create a bootable USB drive separately, see below. There are quite a few tools around to create a bootable USB stick from an ISO file but for best results you should use one that can create a UEFI bootbale disk. I chose Rufus after reading this guide. Scroll down on that page for the details about the settings for Rufus – particularly the partition scheme as GPT partition for UEFI computer and FAT32 file system. If you don’t select these the drive will not boot up unless you have Legacy + UEFI booting enabled in your BIOS settings, which is not usually the default on modern PCs. Note: if you change these settings in Rufus BEFORE selecting the ISO file they are likely to change back to something else, so make sure you double check these settings in Rufus before clicking the Start button. The Lenovo has a handy little ‘Novo button’ which is a fancy name for a recessed reset button next to the headphone socket. When the computer is powered off pressing the Novo Button powers up the computer with a menu to get into the BIOS settings, boot menu or recovery menu. This is easier than working out which keys to tap to get into these options when powering up the computer normally. I did this to select the boot menu and chose my Kingston bootable USB stick and the Windows 8.1 installer booted up. If you have trouble getting your PC to boot from the USB drive it might be because of a problem with the BIOS wanting to boot from UEFI disks. If this happens you will need to get into the BIOS settings and enable Legacy+UEFI booting. When the installation starts you have two options – update and new install. Always choose the new install. You are then presented with the “where do you want to install Windows” screen showing all the current partitions. Wait a few seconds and then just click next. It will automatically have chosen the current main partition and tells you it will make a copy of the files from the previous Windows installation in a folder called windows.old (which should be deleted as soon as installation is complete). This way you retain the original Lenovo recovery partition should you ever need it. If you want the maximum space on the laptops hard drive you could delete all the other partitions including the recovery partition and if you have used the procedure described above to backup the recovery partition you will be able to restore it in the future. As with any fresh install the first thing is to go to settings->updates and install all available updates. For the first time I switch off automatic updates until I’ve checked, downloaded and installed all updates (repeating the check after each time until there are no more updates available). I used a wired Ethernet connection to do do the Windows Updates as the WiFi driver was missing, see below. As expected some devices were not automatically installed. Running the Windows Updates above added a few missing drivers but there were still some that were missing. This is easily resolved because there is a small partition that shows up as a ‘D:’ drive which has a folder containing all the drivers. However, you won’t need them all as Windows 8.1 already identified many of the on-board devices. The easiest way to add the missing devices is from the Device Manager (from the Start Screen type ‘Device Manager’ and wait for it to appear and then click it). You will see all the devices with missing drivers indicated with yellow exclamation marks. Right click on each one, select Update Driver Software… then select Browse my computer for driver software, click the Browse button and select the D: drive. Make sure include subfolders is checked and click next. This should work for all the missing drivers with yellow exclamation marks except one – an unknown device with a device id of ACPI/VPC2004. According to the Lenovo website this is the ‘virtual power controller’. Navigate to the Drivers folder on the D: drive and run the Setup program in the EnergyManager folder to install the drivers for this device. I would also recommend running the setup for the Trackpad from the Drivers/Synaptics folder on the D: drive to install full support for the trackpad including two finger scrolling and other enhancements. 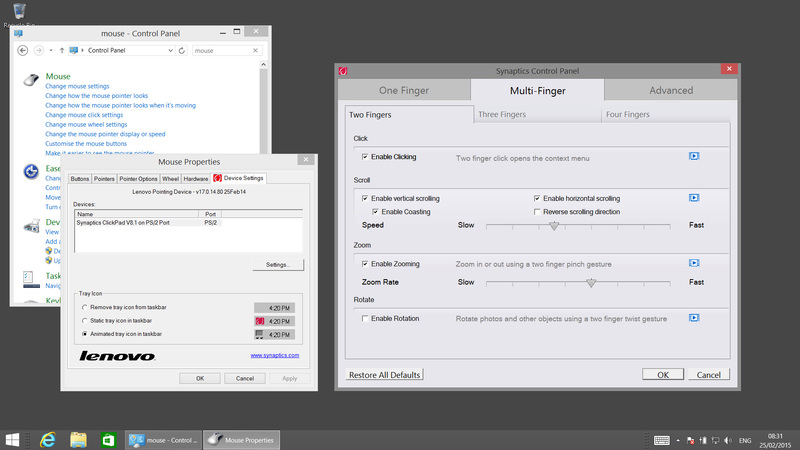 After doing this you will be able to access the full Synaptics settings for the trackpad in the Control Panel as show in the image (click to zoom in). A quick right click on the ‘Computer’ tile to select properties, scroll down to ‘Activate Windows’, click and it was done. No need to enter a licence key! That’s it, a new PC with a clean Windows 8.1 installation – just how all new PCs should be. Any real ‘Value Added’ software from the vendors should still be available, but OPTIONAL, perhaps with a single tile on the Start Menu or Desktop which lets the user choose what to install. Hi Mark, thanks for the very useful article. I tried to perform a fresh install from a USB disk as I could no longer access the hard disk partition. I was prompted to insert the license key. As I don’t have one and I’ve lost access the hard disk, how do I go beyond this step? I believe at that step there is an option to skip entering the licence key – although it’s not necessarily obvious. For the last few versions of Windows it has not been a requirement to enter the licence key during instalation. What should happen is after the installation is complete and you log in with your Microsoft ID it should either activate automatically after a few hours (assuming you are connected to the internet). If it doesn’t then click Start then type ‘activate’ and you should find a way to kick of the ‘activate windows’ process. If all that fails then try the option to activate Windows over the phone. The problem is that it will not allow you to proceed with the installation without entering the license key. Only options are to abort the installation, or enter license key and click “Next”. I downloaded a fresh Windows 8.1 image from the Microsoft site. Hey, awesome article. Worked beautifully. Am really happy with my flex 2 now. BTW, I ran into a small problem. My keyboard backlight stopped working. Any idea which driver is needed for it? thanks.